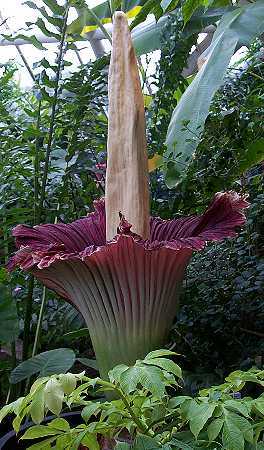 Amorphophallus titanum (Titan Arum) flowered in the glasshouses at Cambridge University Botanic Garden for the first time in August/September 2004. 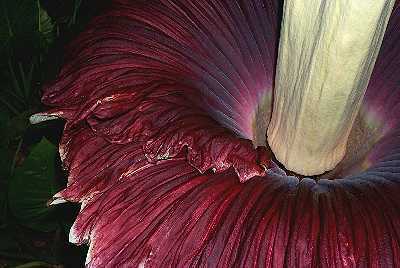 Not many of these aroids from Sumatra have flowered in cultivation. 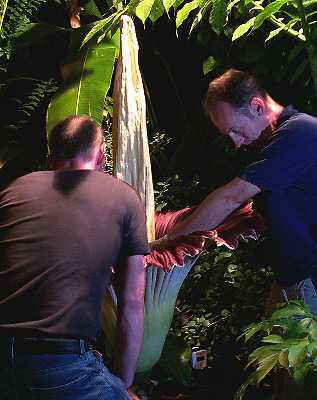 This, the first flower for Cambridge, reached over 1.6 metres in height. 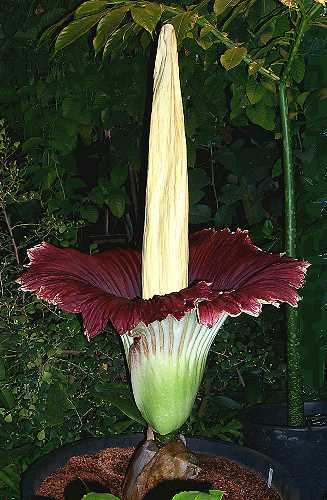 On the afternoon of Thursday 2nd September 2004, the flower started to open fully, and there were large queues of visitors waiting to see it until after midnight. In the absence of the appropriate insects, and with the pollen coming from Kew Gardens in England, and the Botanic Garden in Bonn, Rob Brett and Pete Atkinson had to give a 'helping hand' as 'pollinators'. At the time of writing, it isn't yet known whether their efforts were successful. It is seen again here at left on Friday September 3rd 2004, the 'day after the night before'. And at right on Sunday September 5th 2004, by now starting to fade. The flower finally collapsed towards the end of Monday September 6th 2004. Check out the garden's own pages for the latest news. 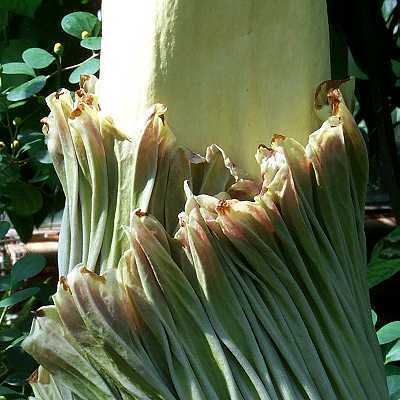 There was a WebCam pointed at the Amorphophallus during flowering, which might still be there.